Matlab's Trendy feature can be used to monitor and collect hourly air quality station data directly from the source url. The data can be feed into the trendy app using the urlfilter and updatetrend commands. The Trendy then can be used to plot the gathered data. I had to let it gather data for few days before I could plot some nice trends. You can already see the diurnal variation in the data below. PM2.5 trend in NYC. If the image is not available, follow the link below. I can also set up an email alert if the PM2.5 reading gets higher than some threshold, say 35ugm/m3. Now you can think about the useful applications of such tools!! Update: well, it has been deprecated! 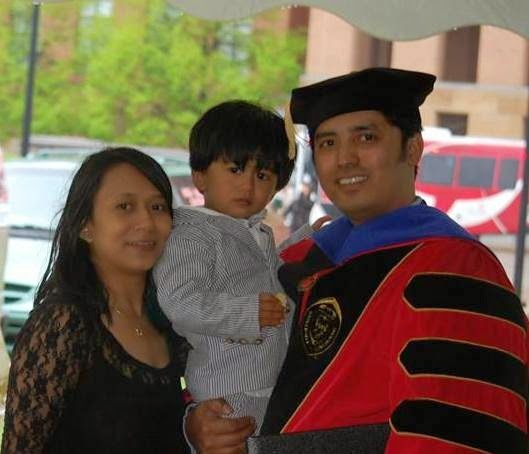 and replaced with "trendy"
Born and raised in Biratnagar, Nepal, Dr. Amit Dongol recently defended his PhD from Physics Department at University of Cincinnati, OH, USA. He will be starting a new job in INTEL from next month. We present a brief chat with Dr. Dongol. He can be reached on LinkedIn at www.linkedin.com/in/amitdongol/, and also maintains a nice personal website www.amitdongol.com . 0. Could you please tell us a little bit about yourself. I was born and raised in Biratnagar, Nepal. I had my SLC exam from Jaycee Bal Sadan, Biratnagar, Nepal. For higher studies (I.Sc and B.Sc physics) I went to Mahendra Morang Adarsha Multiple Campus at Biratnagar. I did my Master in Physics from Tribhuvan University, Kirtipur, Nepal. I was also actively involved in family business of photography and I love taking pictures.Recently I have also reviewed a LabView book for Packt Publication. It is a nice book if anyone is interested in learning and building a research lab for software and hardware automation. The name of a book is LabView Graphical Programming Cookbook authored by Yik Yang. 1. How did you decide to study physics? Did anyone, in particular, influence you? Being good in math, logical thinking and electronics/computer made me decide to study physics. My elder brother (Raja Dongol) helped me to figure out what to study further in the area of my interest. 2. Could you also describe your academic and research journey in USA? What are the challenges for Nepalese students? I came to USA with my Wife (Pooja Shrestha). She got her admission for PhD at University of Cincinnati. Soon after one year I also joined a PhD program at University of Cincinnati and got through qualifier exam immediately and joined a research group in computational biophysics. 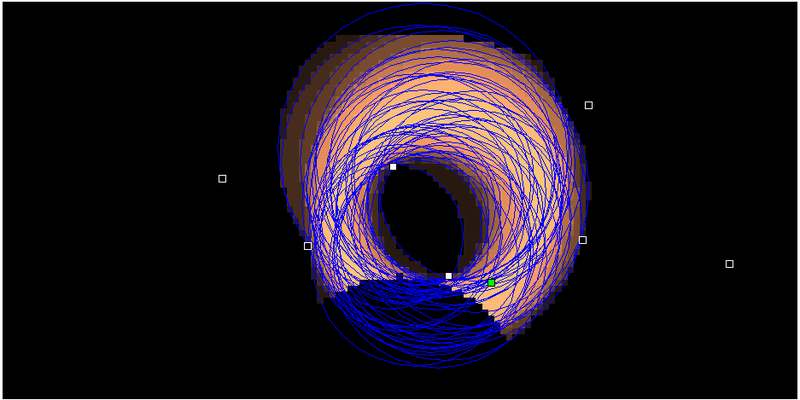 I worked for about one year in the field studying proteins using coarse-grain GO-model. After that I started working in experimental condensed matter physics in the field of nonlinear optics and completed my PhD..The challenges depend upon the individuals, how serious and how well he/she prepares for the challenges. Nothing is impossible, just need to have positive thinking and positive doing blended with hard working and always willing to learn and adapt the situation. If the (TU) courses were to be slightly modified with problem solving strategies and more like real practical problem solving, it would be very helpful to prepare ourselves for education system abroad. It also helps better in cognitive thinking. The challenges are also rewarding. 3. Could you please describe your thesis in plain English? My research is mainly focused on characterizing a quantum well sample using femtosecond pulsed laser. The technique I used is called Four-Wave Mixing (FWM) process that involves at-least two or more pulsed laser. The main goal of the research is to study the exciton, electron grating, and exciton grating formed in a quantum well responsible for fast responsive and highly sensitive real-time holographic imaging. 4. Could you please suggest the practical applications of your research outcomes? Do you have a favorite research paper (written by yourself or somebody else)? My research goal is to characterize and optimize the II-VI/III-V quantum well sample for the purpose of Real-time holographic imaging called Optical Coherence Imaging (OCI). The potential of the OCI is to image an object concealed behind the turbid media and sensitive enough to image a few 10’s of micron sized object or living organism. 5. Which of the skills are strongly recommended for the job hunters in this field? I would say learn everything that you could and there is nothing that you should not learn. If you get an opportunity to learn then don’t let it slide. Good experimental hands (if you are experimentalist) and clever logical thinking (for computational programming) with depth knowledge of the subject and instruments is always required. If you are an experimentalist then you should learn one of the hardware controlling softwares. I would recommend LabView because it is one of the most widely used software where you can make your own software or whole package of applications integrating multiple tools and devices together according to your need of your research. This will really boost your resume and lots of job requires the knowledge of this software. For computational people there are so many things around. It does not matter what you do in the field but atleast you need to have commanding knowledge in at-least one or more programming language like, C, C++, C#, perl, Gromacs, Mathematica, Matlab and many more. Now a days CUDA (a GPU) programming is one of the most rising and demanding to my knowledge. I would recommend it to have this knowledge and skills. I wouldn't say that this is enough but if you can and opportunity provides then learn everything you can. In my case addition to these being able to design and build a website for my research group and making a file server and maintaining also helped me to impress my job interviewer. Being active in social and community services also adds up. There is no one factor but its a whole package I would say. 6. Would you like to add anything else? Learn whatever you can and its never late to start new things. There is a saying in our society “नजाने गाँउको बाटो नसोध्नु” and I believe this is completely wrong. 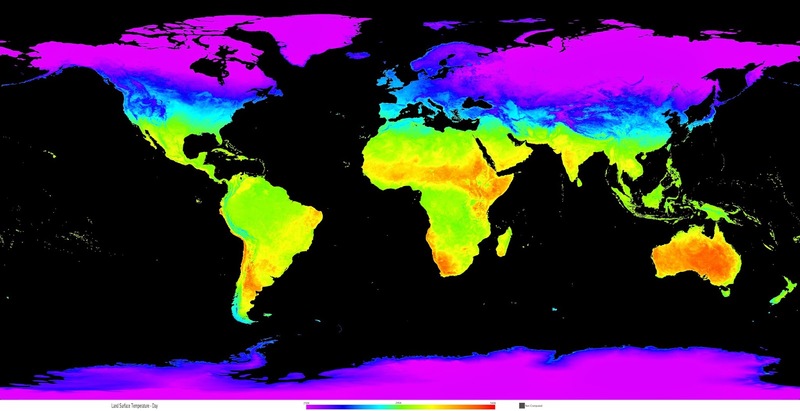 My research involves use of in-situ data, satellite remote sensing data infused with the meteorological information, and application of machine learning techniques to obtain improved estimates of PM2.5. Broadly, my current project involves climate and air quality research, and I have worked with wide variety of model and remote sensing data. This post is concerned about the dense urban observation in the summer database collected over the New York City over the years 2009-2012. 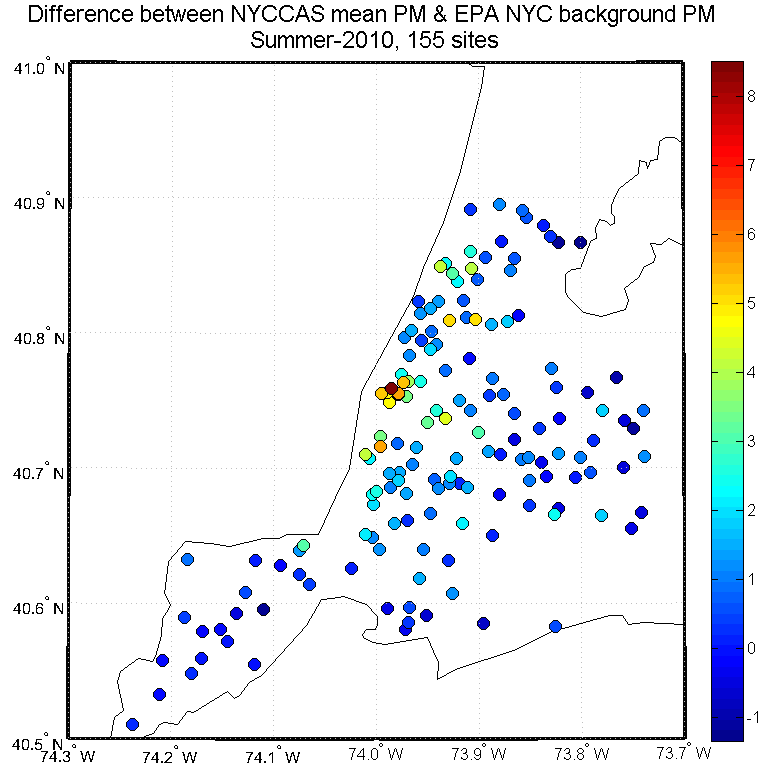 This database gives insights into the PM2.5 and O3 concentration in the urban setting. Specifically for New York City where these pollutants can affect about 8 million people. 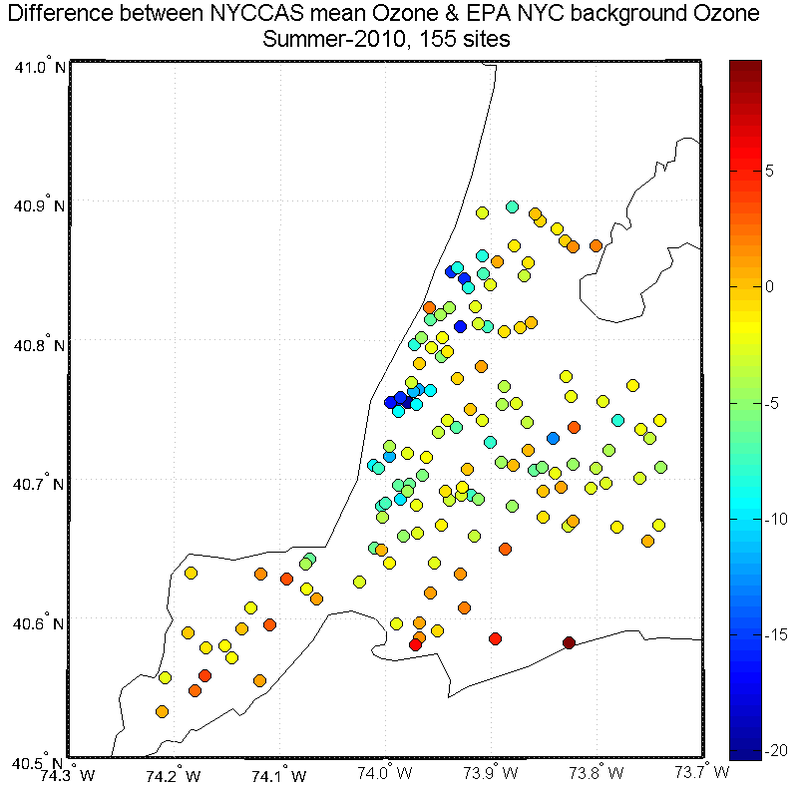 Two figures from summer 2010 are presented below showing the relative concentrations in reference to the background EPA measurements binned over the 15-day measurement period. The densely populated area show increased PM2.5 (ug/m3), while decreased O3 concentrations (ppb). Some interesting geo-chemistry going on!